As the didge is a difficult instrument to play to begin with, it will take some perseverance. Once you can get the “dij” sound, you’re well on your way. 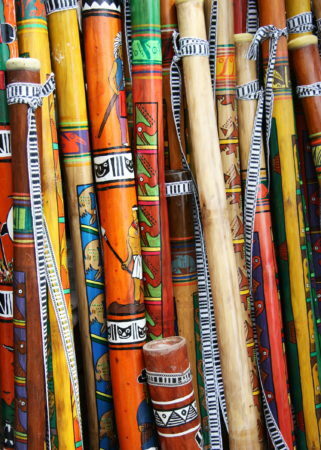 We just love the sound of the didgeridoo, and how much can be done with it. The variation of tone and depth seems infinite, not to mention the unending possibility of rhythms. The aim is to get your lips vibrating at the right frequency for the size of the inside of your didge to produce the drone. Circular breathing is not as hard as you might think. Though it will require a lot of determination and a bit of work. We have probably all heard it involves breathing out your mouth constantly while seemingly breathing in through your nose. Impossible? Not totally! Read on to find out how to circular breathe. As you breathe out your mouth with air from your lungs the drone is produced. Before your lungs run out, fill up your mouth/cheeks with extra air from your lungs but continue breathing out to ensure the drone continues (keeping excess air in your cheeks). Shut off your mouth from your throat using the top of the back of your tongue and using the rest of your tongue and your cheek muscles, push the excess air (that you have saved up) out through your lips trying to keep the drone going as your take a short breath IN through your nose (remember your throat should still be closed off). So circular breathing is all down to your cheek and tongue muscles, (and your brain) and we want to show you exactly how it’s done.